This week's Carnival of Space has set up its big top right here at the Simostronomy blog. For those of you new to the Carnival, let me explain. The Carnival of Space is a collection of links to stories and articles from astronomy and space related blogs. 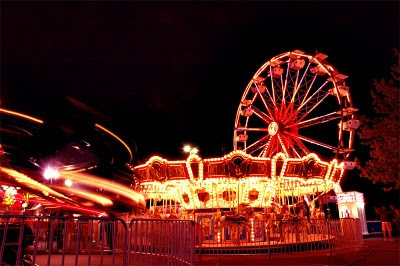 Each week a different blogger or webmaster in the community hosts the carnival. It's a great way to reach a wider audience, showcase your writing, and get to know other writers in the field. The Carnival of Space is coordinated by Fraser Cain of the Universe Today. If you run a space or astronomy blog and would like to participate, write to info@universetoday.com. There is a complete archive of the Carnival of Space available here. The first ride to buy a ticket for in this week's Carnival is on Richard Branson's Virgin Galactic. Phil Plait writes about this part of the future that has arrived today on Bad Astronomy. Citizen astronauts heading for space., or as he puts it, "Barnstorming the final frontier". We've come a long way since the space age's humble beginnings, as Bruce the Flying Singer writes about on Music of the Spheres. So where do space shuttles go when they retire? 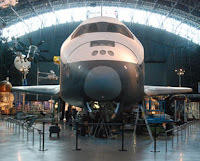 collectSpace blogs about the final flight of shuttle Enterprise. One of the last shuttle missions was to the Hubble Space Telescope for its final repair mission. Alice over at AstroInfo tells us about her harrowing experience making repairs to a planetarium projector and the uncanny similarity to the Hubble servicing mission. Brian Wang at Next Big Future writes about LaserMotive, a company commercializing laser power beaming to transmit electricity without wires for applications where wires are either cost prohibitive or physically impractical. What about nuclear power to get us into space? Next Big Future has you covered there too with an article about an innovative nuclear power generation system design using dusty radioactive material plasma as a fuel. 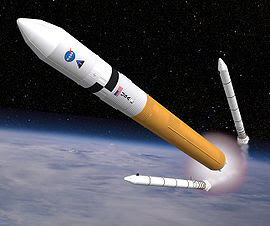 Guest blogger at Next Big Future, Joseph Friedlander, writes about some of the largest systems proposed to reach orbit with big payloads, and then why it’s a lot better to have one big payload. One obvious destination is the Moon. Chris Dann at Weird Warp writes about all the different types of impact craters and their formation, on the Moon and elsewhere. And what might be in those craters? According to Ian O'Neill from Discovery News Space it could be water ice. He examines all the recent findings of water on the Moon. What we once thought was a bone dry place now appears to have bucketloads! Emily Lakdawalla at The Planetary Society Bog writes two stories this week about finding the final resting places of Russian lunar rovers Lunokhod 1 and Lunokhod 2 from images taken by the Lunar Reconnaissance Orbiter. So did these rovers fall in a crater and die, or did they just need a drink of water? I guess you'll have to read to find out. The next best thing to going there is to observe the Moon with a telescope. Stephen Tilford writes about observing the Moon at star parties. This article, from Steve's Astro Corner contains tips on observing, equipment, maps, and interesting facts. Everything you need for a successful showing. What if we want to go further than the Moon? Steve Nerlich at Cheap Astronomy, has a podcast explaining how we can save fuel on interplanetary excursions by using the gravity wells and Lagrange points of the planets. Geez, anything to save a buck, eh, Steve? Darnell Clayton, of Colony Worlds, dashed my hopes of living on a lush, green Mars one day with his blog on terraforming the red planet. But all is not lost. We could still live inside specialized biospheres, or underground...or we could try to find a hospitable planet outside our solar system. Paul Glister takes this even a step further in his blog, Centauri Dreams, suggesting that maybe civilizations could cash in on close encounters of stars to hitch a ride across the galaxy! But be careful which star system you choose. As I pointed out in an article on Universe Today this week, what we think is a normal well-behaved star may suddenly erupt and kick us right back where we started. That's all folks! Hope you enjoyed the ride. Come back and visit the Simostronomy blog again some time. Great job on the Carnival, Mike!